The ancient town of Usha was, for two times, the seat of the Sanhedrin during the Roman period. Jeremiah 50, 15: "Shout against her round about: she hath given her hand: her foundations (Aoshiah) are fallen, her walls are thrown down". 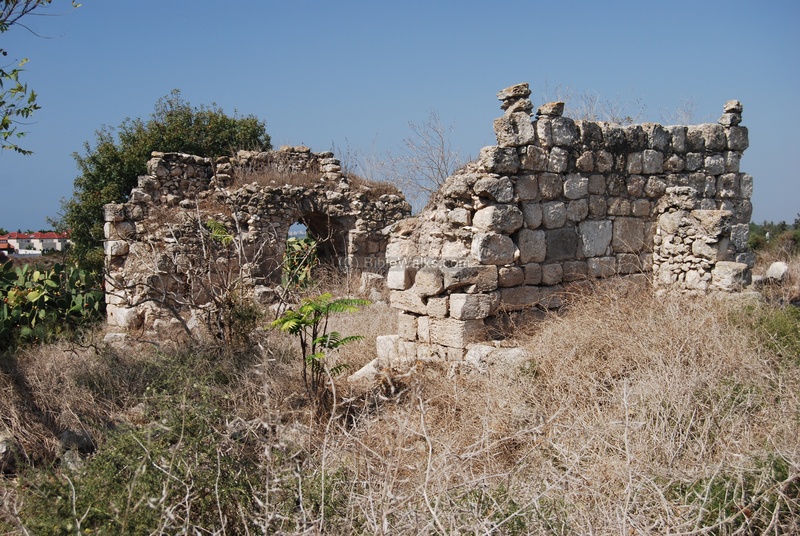 The ancient town of Usha, now in ruins, was once the seat of the Sanhedrin during the Roman period. It was a small agriculture village located in the west Galilee, but was once a center of the Jewish administration in the Holy Land after the revolts against the Romans left the country in devastation. Horvat Usha can be reached by the park road ("Derech Nof") that starts from Givat Ram/Tal in Kiryat Atta. See map below - the suggested parking place is marked on the right side of the map. It is 128M above sea level. The following aerial view shows the points of interest and a map of the area. Point on the purple points to navigate to the selected point in this page or nearby site. Around the village are stone quarries, which were probably in use during the Hellenistic period or earlier during the Iron age. A Hebrew seal was found in the vicinity of Usha, dated to the Israelite Kings (8th century BC). In the Roman times this was a small village, one of many agriculture villages in the area. Two major Roman roads passed near the village, connecting Acre to Sepphoris on its north side, and the western wing of Via Maris (Way of the Sea) on its south west side. The Jewish religious and administrative leadership, the "Sanhedrin", moved to this small village in years 80-116AD. After some time in Yavne (Yabne or Jamnia, in the center of Israel) it returned here once again in 140AD for 10 years. The choice of this small village as the seat of this council was deliberate - to keep its activities on a small key. At these times the Romans were suspicious of any political and religious activities, following two revolts (67-70, 131-135). After the second revolt the Romans restricted some of the Jewish practices, such as ordinating (=giving a degree of a Rabbi) to others, with a penalty of death. Usha was selected due to its animosity as the seed for the renewed Jewish presence in the Galilee, following the total destruction of the Judean center. Rabbi Judah Ben Baba (link) was one of the first to ignore the penalty, and was killed by 300 spears at the age of 70. He is regarded as one of the ten martyrs in the era following the destruction of the second temple. In 150 AD, 15 years after the end of the second revolt , the security of the Jewish population in the Galilee improved, and it was time to move on to larger towns. The Sanhedrin relocated to Shefaram, its twin village located about 2 KM north-east. The Sanhedrin relocated later (163 AD) to Beit-Shearim, Sepphoris and finally to Tiberias. During the Byzantine period (4th-7th century AD) there was a synagogue in the village, but only fragments of the structure were found since the site was not yet excavated. Most of the village's larger stones were removed from the site and many can be found in the private houses in the nearby Kibbutzim. The village continued until the Arabic period, and was destroyed in the 8th century, probably due to an earthquake that devastated the village. The ruins of the site (appears as Kh. Husheh") were examined in the Palestine Exploration Foundation (PEF) survey (1866-1877) by Wilson, Conder and Kitchener. A section of their map is shown below on the right. Notice the double dashed line south of Khirbet Husheh (Horvat Usha). This is a section of the western wing of Via Maris (Way of the Sea) - going north to Acre. "Osheh.—A seat of the Sanhedrin in Galilee, mentioned with Shafram, from which it was two Sabbath days' journey (Tal. Bab. Abodah Zarah, 8 b). Two and a half English miles south-west of Shefa 'Amr (Shafram) is Khirbet Husheh. This would give the correct distance within a few hundred yards". "Kh. Husheh —Heaps of stones ; a small makam (Neby Hushan) on the south-west". 'The ground is everywhere covered with small fragments, with which are mixed cut stones. The remains of a considerable building attracted my attention. It is completely demolished, but the fine blocks which lie on the ground where it stood, and a broken capital, prove that it was built with care and adorned within by columns. 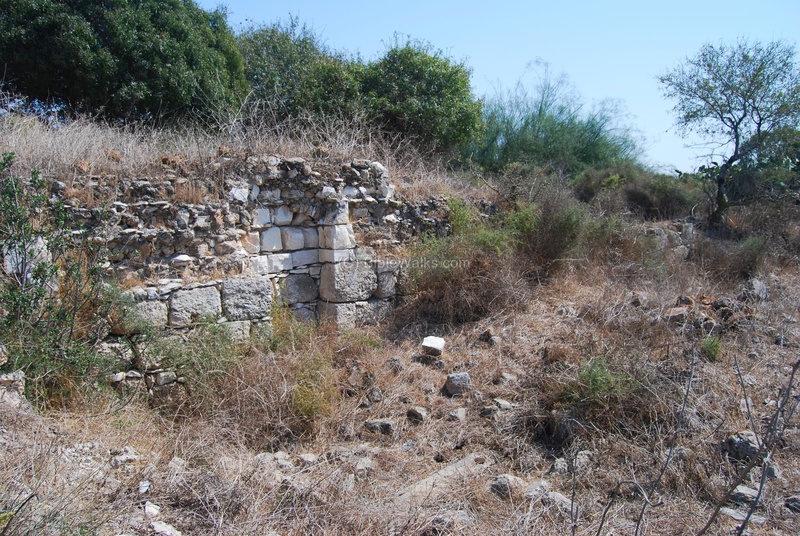 Perhaps it was a synagogue, for the Khurbet Husheh is very probably the ancient Usha, often spoken of in the Talmud in connection with Shefa'Amr, to which it was contiguous, A little before the fall of Beittar the Sanhedrin left Yabneh to establish itself here. They would then naturally build a synagogue at Usha, unless there was one here already'.
' Not far from the ruins of this building may be remarked in a valley to the west a circular well fairly well built with stones of middle size, to which belongs a reservoir. To the south is seen, on a neighbouring hill covered with fine oaks and brushwood, an arched vault constructed of cut stones of ancient appearance, at the end of which is constructed a little niche for a mihrab. Rags are fastened over this wely —a kind of ex voto offerings. It is consecrated to Neby Hushan, the Prophet Hosea, according to Mussulman tradition, which places the tomb of the prophet in this place. But according to a rabbinical tradition the prophet was interred at Safed'. During the beginning of the 20th century, an Arab village was rebuilt using the ancient village stones, and was called Hushe (also Hoshe, Husha or Hawsha) - preserving the ancient name. The villagers in Hushe came from Algeria. Another village, also with North African Muslim Arabs, was established on the hill west to the site - called Kassair or Kasayir (Hebrew: Horvat Kosher). The villagers came to the area to work in the port and refineries of Haifa, and in the newly established Jewish communities. These villages were destroyed in April 1948 during Israel's independence war, after fierce battles. In 1937 a Kibbutz was established 3 KM to the west of the site, and was named Kibbutz Usha. There are two other Kibbutz near the site - Ramat Yochanan (2KM west), and Kefar Maccabbi (2.5KM west). All three are called Gush Zevulun - the cluster of Zebulun. 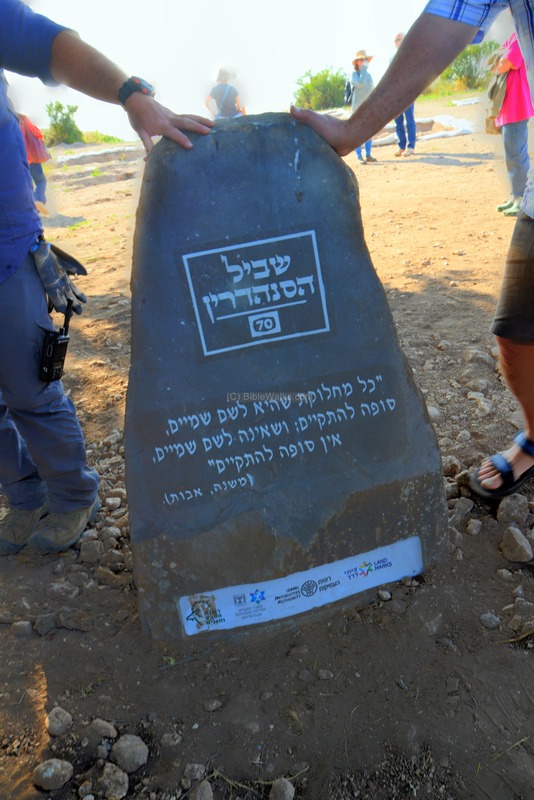 In 2018 the site was incorporated into the newly established "Sanhedrin trail", a connecting all sites of the administrative leadership sites with a hiking discovery trail. 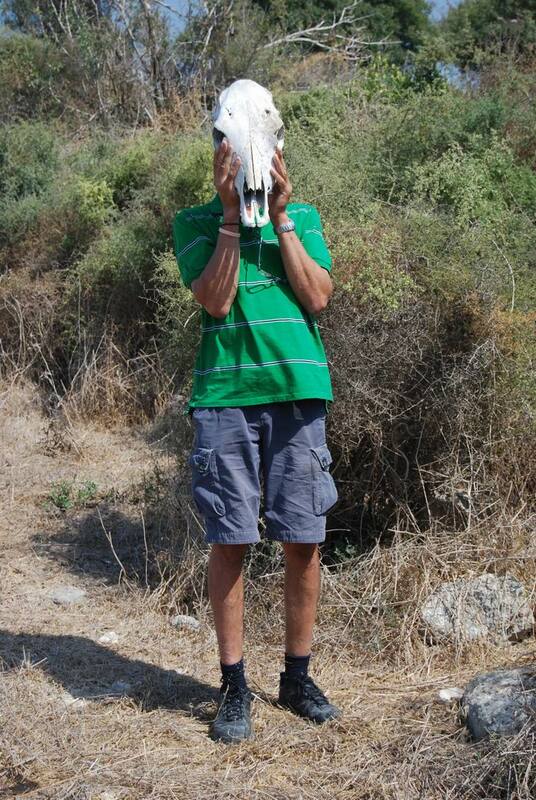 Excavations are conducted by the IAA together with students of nearby schools. 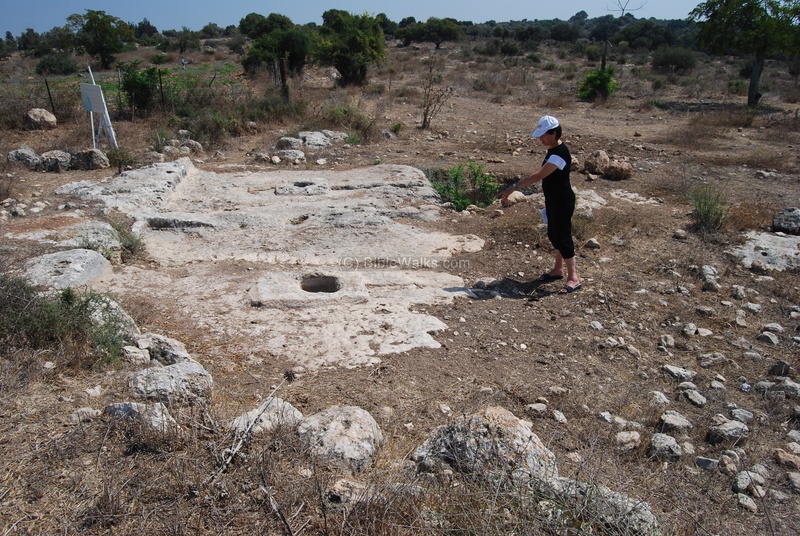 The photo below shows the ruins of one of the Arab houses on the west side of the ancient village. Behind it, in the far background on the left side, are the modern houses of Givat Ram - a superb of Kiryat Atta. A wall stretches along the west side, just above the hillside. Integrated in this wall are ancient building elements and a well. The quad copter view shows the eastern side of Usha, looking towards the north-west. Scattered ruins are all what remained from the Arab village, which was built on the west side of the Roman-period village. On the far left background are the modern houses of Givat Tal, a superb of Kiryat Atta. 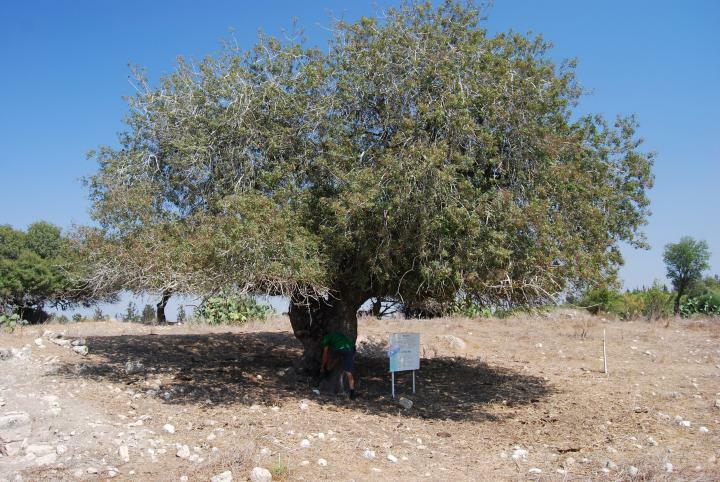 A view of a large tree ( anacardiaceous Pistacia, or Ella Atlantit in Hebrew) is seen below. The ruins of the Arabic village are seen in the panoramic photo below - to the left of the great tree. Clicking on the photo will open a flash viewer, which will allow you to move around and open a full-screen view. A group of 3 Roman-period winepresses are located on the located on the east side of the village. A quadcopter view shows the winepress complex from above. The winepress complex shares a common collecting vat - seen on the right side. The grapes would be placed on the left side, and the workers would crush them with their feet. The grape juice would stay in the treading floor during the fermentation process. After then, the wine juice would allowed to pour thru a blocking and filter groove into the collecting vat. 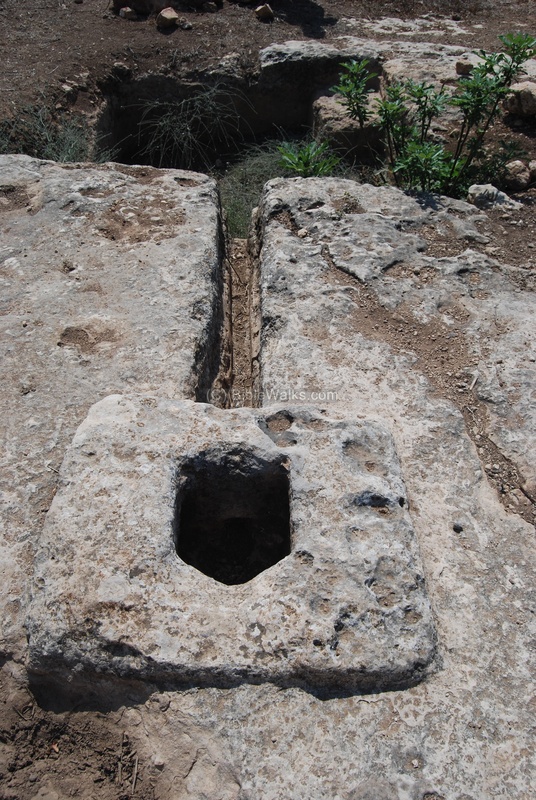 The photo below is a close-up of the middle wine press. The groove led the extracted wine juice into the pit. Steps lead into the bottom of the pit (seen on the right side) in order to allow the workers to step down and collect the juice into jars, then store them for subsequent fermentation. The hole in the center was used for secondary extraction of the juice using a single fixed-screw press. The press squeezed out the must left in the grape skins and stalks after treading. The remains of the crushed grapes would have been collected into the hole, and a pole was used to crush them once again in order to extract the lower quality grape juice. A panoramic view of this section, looking towards north, is seen here. There are many cactus fences in the village that were used for protection. During the end of the summer you can pick their sweet fruits (Sabre)- but beware of these tiny thorns. A detail is seen below, with a view towards the south. A base of a large public structure was found on the north side. This may have been the synagogue, or later converted to a monastery. It could also have been the house of Rabbi Yehuda Hanasi, the compiler of the Mishnah (compilation of Jewish oral traditions) and the president of the Sanhedrin, who spent his youth in Usha in the second century. This aerial view, captured in 2014, shows the traces of the walls prior to the excavations. In 2018 some sections of the structure was exposed by IAA archaeologists together with students from nearby schools. The excavations revealed additional sections of the structure, with an entrance on the east side. A section of a mosaic floor of a wine press was exposed on the south (right) side. The structure was built in the Byzantine period, and destroyed by an earthquake before the 8th century. A layer of charcoal indicates a fierce fire at some time. An oil lamp, decorated by an eight-branch Menorah, was found on the north wall. The excavations continue, and would reveal more sections of this structure, its dating and purposes. The recent excavations also revealed an area of installations east of the structure. 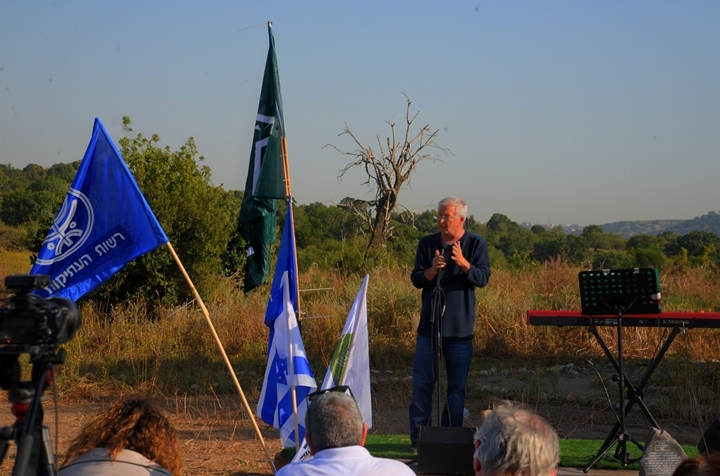 In April 2018 the Israeli Antiquities Authority (IAA), together with neighboring communities, held a ceremony in Usha to officially open the new Sanhedrin hiking trail. The trail starts in Usha, then passes the other places where the Sanhedrin operated, finally reaching Tiberias. The 70km trail was launched on the 70th anniversary of the state of Israel, and commemorates the 71 wise men of the Sanhedrin. Thousands of students and volunteers took part in excavations in the project. One of the speakers was the head of the IAA, Mr. Israel Hasson. Marker stones were placed along the trail. 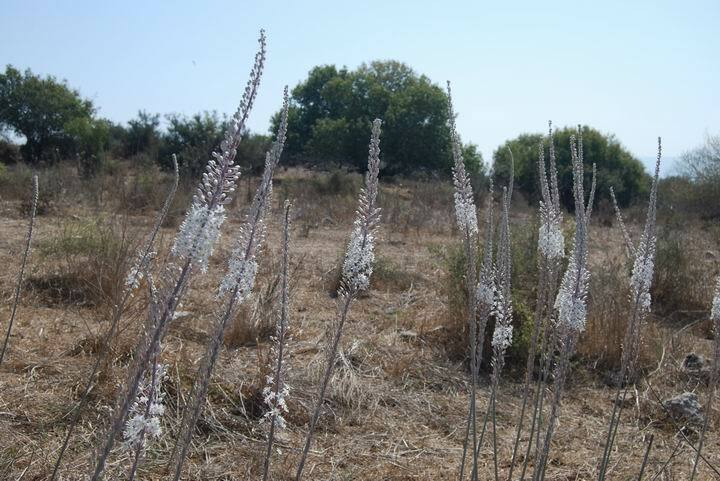 In the village you can notice the Hazav (squill, or: urginea maritima) flowers. They flower at the end of the summer (September/October), signaling the beginning of the Autumn season. Their bulbs were also used to mark the edge of a field or lot, an ancient practice that is widespread in the Holy Land. A legend even held that Joshua used the squill bulbs to mark the borders between the tribes. Arch. 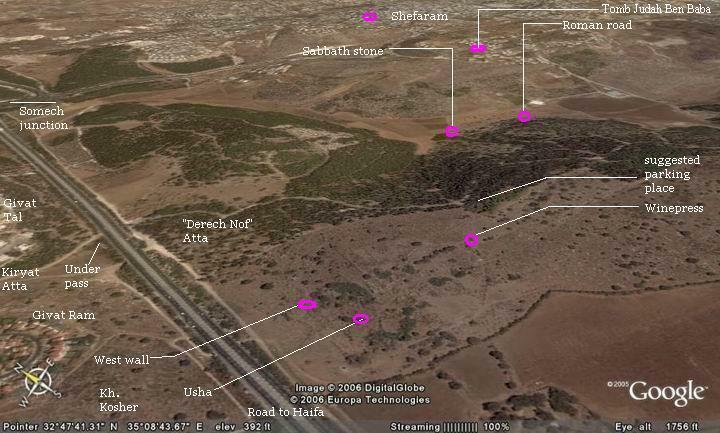 Survey of Israel - Shefr'am Map (24) - Y. Olami & Z. Gal  , site #74: Khirbet Usha. 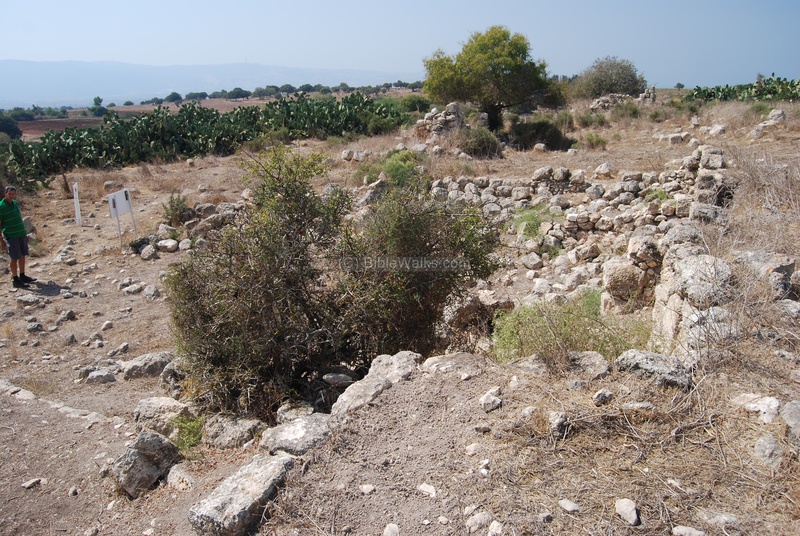 Wine & Oil Production in Antiquity in Israel & other Med. Countries [ISBN 1850755191 1998]Frankel, Rafael. See also our wine press information page. Usha - the source of the name is not certain, but Encyclopedia Ariel suggests that the name is based on a Hebrew root name "Aoshiah" - which is the base of the walls. There is one place in the Bible that uses this word: Jeremiah 50, 15: "Shout against her round about: she hath given her hand: her foundations are fallen, her walls are thrown down: for it is the vengeance of the LORD: take vengeance upon her; as she hath done, do unto her".